Annelies Marie Frank (German: [anəliːs maˈʁiː ˈfʁaŋk]; Dutch: [ɑnəˈlis maːˈri ˈfrɑŋk]); 12 Hunyo 1929 – Pebrero o Marso 1945), midbid sa ngaran na Anne Frank (German: [ˈanə]; Dutch: [ˈɑnə]), pinangaki na Aleman na Hudyo na nagsusurat sa talaarawan. Saro sa mga inuulayan na biktimang hudyo kan Holocaust, nagin sikat kan tigpublikar an The Diary of a Young Girl (originally Het Achterhuis in Dutch; English: The Secret Annex), na dinukomento nya an an saiyang buhay habang nagtatago kan taong 1942 hanggang 1944,sa mga Aleman kan Netherlands durante kan Ikaduwang Gerang Pankinaban. Ini an saro sa mga sikat na libro asin ginibong dula asin pelikula. 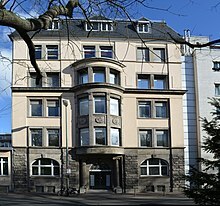 Si Frank pinangaki na Annelies or Anneliese Marie Frank kan Hunyo 12, 1929 sa Maingau Red Cross Clinic sa Frankfurt, Germany, an saiyang magurang na sina Edith (née Holländer) asin Otto Heinrich Frank. Igwa syang matuang tugang na si Margot. An mga Franks sinda mga liberal na Hudyo, asin dae nagpapasakop sa kustombre asin tradisyon kan Judaismo. Nkaistar sinda sa komunidad nin Hudyo asin bakong Hudyo kan manlaenlaen na relihiyon. Si Edith an mas tutok na magurang mientras si Otto mas interesado sa akademya asin may pagkaaram na maray sa library; parehas na tig motibar an mga aki na magbasa . Kan pinangaki si Anne, an pamilya nag-istar sa Marbachweg 307, na nagrenta sindang duwang iskalon. Kan1931 an pamilya naglipat sa Ganghoferstrasse 24 sa lugar nin mga liberal na inaapod na Dichterviertel (Poets' Quarter). An mga harong na ini yaon pa.
↑ 1.0 1.1 Anne Frank Fonds. ↑ 2.0 2.1 Barnouw & Van Der Stroom 2003, pp. 3, 17. ↑ "Geschichte". Frankfurt Red Cross Clinics. https://www.rotkreuzkliniken.de/drk_schwesternschaft_bad_homburg-maingau.html. ↑ "Wohnhaus der Familie Frank". City of Frankfurt. https://www.frankfurt.de/sixcms/detail.php?id=3865&_ffmpar%5B_id_inhalt%5D=2461110. Barnouw, David; Van Der Stroom, Gerrold, eds. (2003). The Diary of Anne Frank: The Revised Critical Edition. New York: Doubleday. ISBN 0-385-50847-6. Berryman, John (2000) . "The Development of Anne Frank". In Enzer, Hyman Aaron; Solotaroff-Enzer, Sandra. Anne Frank: Reflections on her life and legacy. Urbana: University of Illinois Press. ISBN 978-0-252-06823-2. Bigsby, Christopher (2006). Remembering and Imagining the Holocaust: The Chain of Memory. New York: Cambridge University Press. ISBN 978-0-521-86934-8. Enzer, Hyman Aaron; Solotaroff-Enzer, Sandra, eds. (20 December 1999). Anne Frank: Reflections on Her Life and Legacy. Urbana: University of Illinois Press. ISBN 978-0-252-06823-2. Frank, Anne (1995) . Frank, Otto H.; Pressler, Mirjam, eds. Het Achterhuis [The Diary of a Young Girl – The Definitive Edition] (in Dutch). Massotty, Susan (translation). Doubleday. ISBN 0-553-29698-1. ; This edition, a new translation, includes material excluded from the earlier edition. Frank, Anne (1989). The Diary of Anne Frank, The Critical Edition. Netherlands State Institute for War Documentation. New York: Doubleday. ISBN 978-0-385-24023-9. Frank, Anne; Holmer, Per (2005). Anne Franks dagbok : den oavkortade originalutgåvan : anteckningar från gömstället 12 juni 1942 – 1 augusti 1944 [Anne Frank's Diary: The Unabridged Original Edition: Notes From the Hiding Place] (in Swedish). Stockholm: Norstedt. ISBN 978-91-1-301402-9. Lee, Carol Ann (2000). The Biography of Anne Frank – Roses from the Earth. London: Viking Press. ISBN 978-0-7089-9174-9. Müller, Melissa (2013) . Anne Frank: The Biography (in German). New York: Henry Holt and Company. ISBN 978-0-8050-8731-4. Prose, Francine (2009). Anne Frank: The Book, the Life, the Afterlife. New York: HarperCollins. ISBN 978-0-06-143079-4. Rosow, La Vergne (1996). Light 'n Lively Reads for ESL, Adult, and Teen Readers: A Thematic Bibliography. Englewood, Colo: Libraries Unlimited. p. 156. ISBN 978-1-56308-365-5.
van der Rol, Ruud; Verhoeven, Rian (1995). Anne Frank – Beyond the Diary – A Photographic Remembrance. Langham, Tony & Peters, Plym (translation). New York: Puffin. ISBN 978-0-14-036926-7. Westra, Hans; Metselaar, Menno; Van Der Rol, Ruud; Stam, Dineke (2004). Inside Anne Frank's House: An Illustrated Journey Through Anne's World. Woodstock: Overlook Duckworth. ISBN 978-1-58567-628-6. "2003 Annual Report". Anne Frank Fonds. 1 July 2004. http://www.annefrank.ch/index.php?page=750. Retrieved on 18 April 2012. "Biography – Anne Frank". Anne Frank Fonds. http://www.annefrank.ch/209.html. Retrieved on 19 June 2013. "Anne Frank House, Annual Report 2005" (PDF). Anne Frank House. March 2006. Archived from the original on 16 February 2008. https://web.archive.org/web/20080216031433/http://annefrankhuis.nl/upload/downloads/AFreport2005.pdf. Retrieved on 18 April 2012. Barnauw, David; van der Stroom, Gerrold (25 April 2003). "Who Betrayed Anne Frank?" (PDF). Netherlands Institute for War Documentation, Amsterdam. Archived from the original on 31 March 2010. https://web.archive.org/web/20100331135948/http://www.niod.nl/annefrank/Who%20betrayed%20Anne%20Frank.pdf. Retrieved on 3 September 2016. Blumenthal, Ralph (10 September 1998). "Five precious pages renew wrangling over Anne Frank". The New York Times. https://www.nytimes.com/1998/09/10/world/five-precious-pages-renew-wrangling-over-anne-frank.html. Retrieved on 17 April 2012. Boretz, Carrie (10 March 1995). "Anne Frank's Diary, Unabridged". New York Times. https://www.nytimes.com/1995/03/10/nyregion/anne-frank-s-diary-unabridged.html. Retrieved on 3 May 2013. "James Whitbourn: Annelies". Chester and Novello. http://www.chesternovello.com/default.aspx?tabid=2432&state_3041=2&workid_3041=14649. Retrieved on 6 April 2012. Clinton, Hillary (14 April 1994). "Remarks by the First Lady, Elie Wiesel Humanitarian Awards, New York City". Clinton4.nara.gov. http://clinton4.nara.gov/WH/EOP/First_Lady/other/1994-04-14-first-lady-remarks-elie-wiesel-humanitarian-awards.html. Retrieved on 17 April 2012. Engel, Pamela (23 March 2013). "Saplings from Anne Frank's Tree Take Root in US". Yahoo! News. Associated Press. Archived from the original on 3 December 2013. https://web.archive.org/web/20131203031108/http://bigstory.ap.org/article/saplings-anne-franks-tree-take-root-us. Retrieved on 23 March 2013. Faurisson, Robert (November–December 2000). The Diary of Anne Frank: is it genuine?. 19. Journal of Historical Review. http://www.ihr.org/jhr/v19/v19n6p-2_Faurisson.html. Retrieved on 18 April 2012. Feldman, Ellen (February–March 2005). "Anne Frank in America". American Heritage 56 (1). http://www.americanheritage.com/content/anne-frank-america. Retrieved on 19 April 2012. Ferguson, Kate Katharina (9 March 2012). "Madame Tussauds Unveils Anne Frank Wax Figure". Der Spiegel (Berlin). http://www.spiegel.de/international/germany/0,1518,820411,00.html. Retrieved on 18 April 2012. Gabbatt, Adam (2 October 2009). "Holocaust Film footage of Anne Frank posted on YouTube". The Guardian (London). https://www.theguardian.com/world/2009/oct/02/anne-frank-video-release-youtube. Retrieved on 6 April 2012. Graver, Lawrence. "One Voice Speaks for Six Million: The uses and abuses of Anne Frank's diary". Yale Holocaust Encyclopedia. Yale University Press. http://www.myjewishlearning.com/history/Modern_History/1914-1948/The_Holocaust/Anne_Frank/Controversies.shtml. Retrieved on 17 April 2012. "Welcome to the Anne Frank educational centre". Jugendbegegnungsstätte Anne Frank. 2012. http://www.jbs-anne-frank.de/english/. Retrieved on 12 September 2012. Kreijger, Gilbert (20 November 2007). "Dutch court saves Anne Frank tree from the chop". Reuters. https://www.reuters.com/article/2007/11/20/idUSL20266089. Retrieved on 6 April 2012. Laeredt, Angela (5 May 1995). "Anne Frank: After the diary stopped". The Independent (London). https://www.independent.co.uk/life-style/anne-frank-after-the-diary-stopped-1618257.html. Retrieved on 18 April 2012. Levin, Meyer (15 June 1952). "The Child Behind the Secret Door; An Adolescent Girl's Own Story of How She Hid for Two Years During the Nazi Terror". The New York Times Book Review. http://select.nytimes.com/gst/abstract.html?res=F60614FB3A5E107A93C7A8178DD85F468585F9. Retrieved on 17 April 2012. Mandela, Nelson (15 August 1994). "Address by President Nelson Mandela at the Johannesburg opening of the Anne Frank exhibition at the Museum Africa". African National Congress. Archived from the original on 3 December 2007. https://web.archive.org/web/20071203223504/http://www.anc.org.za/ancdocs/history/mandela/1994/sp940815.html. Retrieved on 17 April 2012. Marcuse, Harold (7 August 2002). "Lessons from The Diary of Anne Frank". history.ucsb.edu. University of California, Santa Barbara. http://www.history.ucsb.edu/faculty/marcuse/present/13MarcuseAnneFrank.htm. Retrieved on 17 April 2012. Max, Arthur (25 June 2007). "Anne Frank's Cousin Donates Family Files". The Washington Post. Associated Press. https://www.washingtonpost.com/wp-dyn/content/article/2007/06/25/AR2007062500517.html. Retrieved on 18 April 2012. McCrum, Robert (1 August 2010). "Anne Frank: was her diary intended as a work of art?". The Guardian (London). https://www.theguardian.com/books/2010/aug/01/anne-frank-diary-robert-mccrum. Retrieved on 6 April 2012. Michaelsen, Jacob B. (Spring 1997). "Remembering Anne Frank". Judaism: A Quarterly Journal of Jewish Life and Thought 46 (2). https://www.questia.com/magazine/1G1-19680329/remembering-anne-frank. Retrieved on 17 April 2006. Morine, Suzanne (1 December 2007). "People in Anne Frank's Life". Anne Frank Diary Reference.org. http://www.annefrankdiaryreference.org/apeople.htm. Retrieved on 17 April 2012. "Nothospital" (in German). Gedenkstätten Bergen-Belsen. Stiftung Niedersächsische Gedenkstätten. Archived from the original on 27 March 2013. https://web.archive.org/web/20130327113617/http://bergen-belsen.stiftung-ng.de/de/geschichte/dp-camp/nothospital.html. Retrieved on 23 July 2013. O'Toole, Emer (2 May 2013). "Anne Frank's diary isn't pornographic – it just reveals an uncomfortable truth". The Guardian. https://www.theguardian.com/commentisfree/2013/may/02/anne-franks-diary-pornographic-uncomfortable-truth. Retrieved on 3 May 2013. "Anne Frank Tree Blown Down". Radio Netherlands. 23 August 2010. http://www.rnw.nl/international-justice/bulletin/anne-frank-tree-blown-down. Retrieved on 17 April 2012. Romein, Jan. "The publication of the diary: reproduction of Jan Romein's Het Parool article Kinderstem". Anne Frank Museum. Archived from the original on 29 April 2007. https://web.archive.org/web/20070429082213/http://www.annefrank.org/content.asp?pid=112&lid=2. Retrieved on 17 April 2012. Rosenblatt, Roger (14 June 1999). "The Diarist Anne Frank". Time. http://www.time.com/time/magazine/article/0,9171,991265,00.html. Retrieved on 17 April 2012. Stevens, Mary (1 September 1989). "2 videos recollect life in World War II". Chicago Tribune. http://articles.chicagotribune.com/1989-09-01/entertainment/8901090690_1_star-rating-rain-man-spanish-subtitles. Retrieved on 6 April 2012. Stichting, Anne Frank. "Typhus". Betrayed. Anne Frank House. Archived from the original on 17 February 2007. https://web.archive.org/web/20070217034951/http://www.annefrank.org/content.asp?pid=160&lid=2. Retrieved on 17 April 2012. Stichting, Anne Frank. "Publicity about Anne Frank and her Diary: Ten questions on the authenticity of the diary of Anne Frank". Anne Frank House. Archived from the original on 5 October 2007. https://web.archive.org/web/20071005213344/http://www.annefrank.org/content.asp?PID=790&LID=2. Retrieved on 17 April 2012. Stichting, Anne Frank (20 September 2005). "Reaction decease Simon Wiesenthal". Anne Frank House. Archived from the original on 30 October 2007. https://web.archive.org/web/20071030093236/http://www.annefrank.org/content.asp?PID=700&LID=2. Retrieved on 17 April 2012. Stichting, Anne Frank. "What did Otto Frank do to counter the attacks on the authenticity of the diary? Question 7 on the authenticity of the diary of Anne Frank". Anne Frank House. Archived from the original on 21 October 2007. https://web.archive.org/web/20071021114818/http://www.annefrank.org/content.asp?PID=797&LID=2. Retrieved on 18 April 2012. Stichting, Anne Frank. "Publicity about Anne Frank and her Diary: Legal rulings". Anne Frank House. Archived from the original on 13 October 2007. https://web.archive.org/web/20071013161211/http://www.annefrank.org/content.asp?PID=387&LID=2. Retrieved on 18 April 2012. Thomasson, Emma; Balmforth, Richard (23 January 2008). "Plan agreed to save Anne Frank tree from the axe". Reuters. https://www.reuters.com/article/2008/01/23/us-dutch-annefrank-idUSL2338377820080123. Retrieved on 17 April 2012. "Holocaust Encyclopedia – The Netherlands". The United States Holocaust Memorial Museum. http://www.ushmm.org/wlc/en/article.php?ModuleId=10005436. Retrieved on 17 April 2012. Ining pahina huring pinagbago kan 12 Marso 2019, alas 12:27.